This is the sermon I preached last Sunday, 3/17/19, at St. Timothy Lutheran Church. The gospel text is Luke 13:31-35. Our gospel lesson from Luke is soap opera-esque with all the conflicting wants and desires it portrays. In the midst of the clashing cravings, Jesus grounds his ministry in the divine necessity, God’s desire for Jesus. The first want we come across is Herod’s desire to kill Jesus. This information is brought to Jesus by some Pharisees. They were not all lumped together. There were those who were sympathetic to Jesus’ mission. However, in essence, they were still encouraging Jesus to abandon that mission and save himself. Herod’s was no idle threat. After all, Herod had beheaded John the Baptist, Jesus’ cousin. You’d think Jesus would be scared, literally to death. Jesus doesn’t even mention Herod’s threat because he was so consumed with his mission. The Pharisees literally tell Jesus, “Depart and go from here.” Jesus does not cower or react fearfully. He parries. He retorts. He turns the Pharisees’ phrase around, literally speaking truth to power, telling the Pharisees to “Go, and tell that fox for me…” (v. 32). We think of someone being compared to a fox as sly, but this was not the meaning in Jesus’ day. Someone like a fox was an insignificant person, a deceiver, and above all a destroyer, which is Luke’s emphasis. Foxes were considered voraciously destructive. Jesus grounds ministry in divine necessity. The Father wants Jesus to complete his work. Jesus must be on his way. Literally, “it is necessary.” The divine imperative in the Greek shows whose hand is behind the “must.” Jesus speaks directly of a brief, limited time that he has to complete his ministry and indirectly of his death and resurrection, which are God’s desire, the finishing of his course. He would be following God’s mission for him, in God’s time, not human time. Ultimately, Jesus knows exactly what awaits him in Jerusalem, but he does not change course for anyone—friend or foe. He doesn’t go to Jerusalem to escape death, but to die there. Jesus has frequently wanted to restore and shelter the people of Jerusalem.Here we have Jesus portrayed as a mother hen in contrast to Herod, the fox, who represented the powerful who oppress God’s people. Jesus as the wisdom of God has repeatedly offered Israel, God’s people, his motherly love and protection. God is not only a redeeming, but protecting and nurturing God. Mother Hen Jesus does not offer the absence of danger, but the fullness of his unguarded, open-hearted, vulnerable self in the face of all that threatens and scares us. He gives his own body and his own life for us. His very being becomes a place of refuge and return for his children—all his children, even those who want to stone him and kill him. Here is the image of a mother hen who plants herself in the center of her children’s terror and offers refuge there—where the feathers fly and the blood is shed (Debie Thomas). The image of a mother hen and her chicks is a powerful one. In instances where there have been fires in barnyards, a mother hen may be found burned to death. 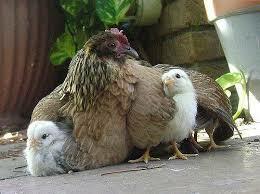 When the hen is moved, unharmed chicks are found under her wings. She has given her life for them. What a vivid image of what Jesus longed to do for Jerusalem, all Israel and for us. The people of Jerusalem have not wanted Jesus to gather them. Jesus contrasts a Jerusalem that has rejected and killed the prophets who were sent to it with the sheltering wings of a mother hen and the trusting chicks that know to seek protection with her. What would become of the young if they did not accept the shelter of their mother’s wings? The Jerusalemites made their choice and God left them to their own devices. It is sheer irony that the city that housed God’s temple also housed a persistent refusal to hear God’s word. Afraid for their own security, Jerusalem was its own worst enemy. As a result of their rejection of God’s gift of love and security, Jerusalem would be destroyed. By the time Luke wrote his gospel, its destruction had fulfilled Jesus’ words. And yet, what was our Savior’s response?...one of sorrow. We know what God wants, but what do we want? Is our desire simply for comfort and an easy life? Do we want things or health or money? Or do we want what God wants for us, which is to respond to God’s overtures with love? Are we willing, in moments of political and theological crisis, to boldly speak truth to power? Are we willing to be the prophetic voices that condemn racism, protest walls that divide rather than bring us together, call people to environmental justice and speak the words of prophetic poetry that helps us name justice with beauty and truth? We are horrified by the carnage in New Zealand on Friday, but what can we do? The very least we can do is to pray. Globally, religious groups have expressed their solidarity. Members of other faiths have been welcoming Muslims and those affected into their own places of worship (Axios.com). I’m curious, do any of us know any Muslims? If so, have we ever participated in worship with them? Maybe we’ve been to a wedding or funeral. If not, take advantage of any opportunities we have to become acquainted with Muslim people. On Main Street in Jamestown, we have the Jamestown Islamic Society and Mosque. Stop by and get to know folks there. Friday afternoon prayers are at 1:30. Our family experienced nothing but welcome from the Muslim people in Bethlehem and the surrounding area. The two parts of today’s gospel have contrasting animal images of a fox and a hen. They are also connected by the word translated as “want,” also meaning “to wish” or “to will.” There is a startling difference in the “wills” of Herod and Jesus. One is like the predatory, destructive fox, while the other is like a comforting, protective hen. God wants to gather us in, just as Jesus longed to gather the people of Jerusalem. God’s living Word addresses us, helping us name our brokenness, inviting us into a new relationship, a new way of living in this world. God wants us to live courageously because we have been sheltered under his wings and abide in his love (Debi Turley). During this Lenten wilderness of repentance and transformation, may the desire of Jesus become our desire as well. May the way of the mother hen—the way of vulnerability, sorrow, hope and eternal welcome lead us home. Loving God, you call us to shelter under your wings, but we resist. As the days and years pass, help us to rely less on the security we try to create, and more on the security you provide. Amen.